This month, I’m exploring words named after people. Today the mausoleum is thought of as a repository for our lost loved ones and part of what make historic cemeteries beautiful, peaceful places of quietude. Originally, however, the word had a very specific meaning as the tomb of Mausolus, king of Caria, who ruled part of the Greek Empire in the 4th century B.C.E. The mausoleum is considered one of the Seven Wonders of the Ancient World. Words like mausoleum— that once honored or defamed a person— eventually crossover to the point we no longer even realize who the word refers to. 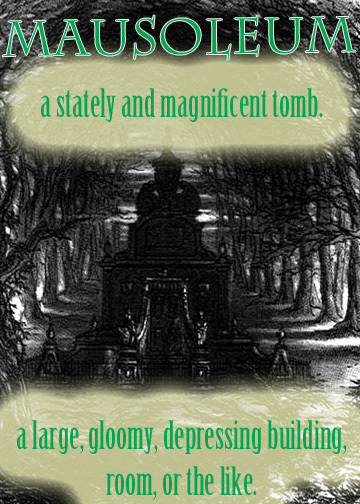 We don’t even capitalize mausoleum, so how would you know? The ruins of the Mausoleum at Halicarnassus in Caria (now Bodrum in Turkey), constructed for King Mausolus during the mid-4th century BC.